Our teeth are important, there is no denying that. What can also never be denied is that our teeth need to be tended to and kept as healthy as they can be at all times. It’s easy to do. Brush, floss, avoid sugar, go to the dentist for regular checkups — it’s easy. What is not easy, however, is keeping your child’s teeth healthy. Whether it’s strops at teeth brushing time or a fear of the dentist, it is undeniably difficult to provide your child with a clean bill of oral health. It’s difficult, but it’s not impossible. To find some advice on how you can keep your child’s teeth as healthy as can be, make sure to read on. Were you of the impression that you should only begin tending to your child’s oral health when they get their first tooth? Well, if you thought this, you were wrong. Yes, if you want to keep your child’s teeth healthy right off the bat, then you should begin tending to their teeth way before their first tooth appears. You should do so as soon as they are born, in fact. You should do so because your child, whether they’re one minute old, one month old or one year old, will have about 20 primary teeth in their jaw. Some of these teeth are already fully developed, as well. So, even before your baby begins teething, run a damp, clean washcloth around their gums. This will help to keep bacteria at bay, and that is something that needs to happen if you are going to hit the ground running when it comes to keeping your child’s teeth healthy. Once teeth do begin to show themselves in your child’s mouth, make sure to use a specially formulated fluoride toothpaste, but only in small, grain-of-rice-like measures. Whilst you’re at it, make sure you use a specifically designed infant toothbrush, too. As important as it is to tend to your child’s teeth yourself, you will have to hand over the reins of doing so to a paediatric dentist at some point, preferably around their first birthday. You should do so because, one, you will come into contact with all the information you need to look after your child’s oral teeth during their infancy. You should do so because, two, it will allow for any problems to be spotted by eyes that are trained to spot them, and the earlier they are spotted the easier it will be to get a diagnoses and then treatment for them. You should do so because, three, it will make your child more comfortable with the big, scary dentist and their chair, and the earlier your little one feels this comfort, the better. If your child shows apprehension, or downright hatred, towards going to the dentist, then you’re going to have to do something about it. You’re going to have to do something about it because, whether they like it or not, your child has to have their teeth examined professionally. So, by hook or by crook, you must get your child into that chair that they so dread! What should you do to get your child into a dentist’s chair? First and foremost, you have to pinpoint what it is that is actually troubling your child. Is it the dentist? If so, make sure to do some background research into the paediatric dentists in your area before you commit to any of them. Check out likeminded patient reviews online, and only ever consider a surgery if they, like Tooth Doctor, do actually provide them. Or is it the dentist experience on the whole that is making your child feel so apprehensive? If so, pay a visit to the surgery of your choosing yourself before you take your child with you so you can judge how child friendly the layout of it is. Whatever you do, whether online or in person, just make sure you do your own market research before you commit to a surgery. Oh, and it might be a good idea to throw in a few incentives to go to the dentist for your children, too. One lollipop never hurt anybody! You, yes, you, should pretend to be a dentist at home. Yes, we know you’re not qualified. Yes, we know you don’t know your spoon excavator from your burnisher. Yes, we know you don’t know which end of the curette is the right way up. Want to hear the good news? You don’t have to! By setting up a mock dental surgery at your home, or by giving your child some dentist-themed toys to play with, you will make the whole thing feel normal to them. When you make a visit to the dentist a normal thing for your children to experience, you win half the battle there and then. 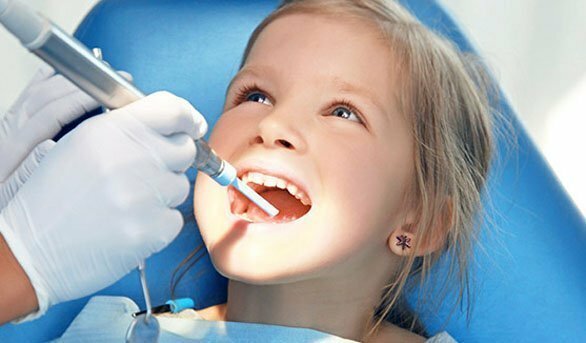 To avoid those mid-checkup screams (and possibly bites), acclimatise your children for the dentist by starting the experience at home.